Long Point Lighthouse near Twillingate in Newfoundland. After browsing through the exhibits at the Fleur-de-Lys Museum, which interpret the history of the Baie Verte Peninsula and the town itself, we headed off to visit Seal Cove in White Bay, another quaint fishing village. Before leaving the Baie Verte Peninsula we dropped by to see the Rattling Brook Falls in the town of Rattling Brook, Green Bay. According to the travel guide, the falls are quite a sight as they drop approx 400 feet. Well, it would appear the writer of the guide hadn't actually visited the location themselves since it was tucked away and hidden by a high vertical crevasse. Indeed the drop would have been 400 feet and perhaps during the spring melt it might have been a thundering waterfall but certainly not when we visited. Onwards and upwards, we continued our journey to the city of Grand Falls-Windsor and after doing a spot of grocery shopping sought out the Salmonid interpretation Centre. Here visitors can watch as the Atlantic Salmon climb the fish ladders allowing them access to their spawning grounds up river, which would otherwise be inaccessible because of the nearby man-made dam barrier. There are also underwater viewing windows and live exhibits. 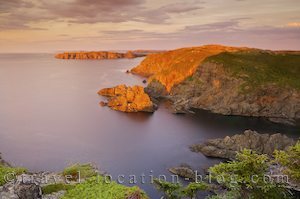 Our aim was to have sunset near Twillingate since the weather was co-operating so far, so we headed along the Road to the Isles (Highways 340 and 330) towards Twillingate via Lewisporte. The Road to the Isles encompasses large inhabited offshore islands such as Chapel Island, New World Island, and the Twillingate Islands. The Long Point Lighthouse is situated on North Twillingate Island at Long Point which struts out into Notre Dame Bay. Although when you pull into the car park at the lighthouse there is a viewing platform, there is also a two minute trail leading past the lighthouse up a short set of stairs. From here there's a clear view of the coastline and during the right time of year, the odd splattering of icebergs. Tonight we sat out in front of the lighthouse on the edge of sheer cliffs with (by then) brooding and thunderous clouds looming above but with the sunset shades of yellow catching their under-bellies. Each sunset is different - in shades of colour, in the dark clouds or white puffy masses above or, on a clear night, the sun hits the horizon and is completely uninterrupted. From the cliff tops we could see the ocean spread out before us dotted by icebergs, it seems to have no boundaries and is only framed by the pastels of sunset which stretch out towards us from the horizon. This was yet another magical night! Later, we drove back along to the town of Twillingate and settled into our camp site at the Peyton's Woods RV Park and Campground.